Semtech Corporation (Nasdaq:SMTC), a leading supplier of analog and mixed-signal semiconductors, today announced its LoRa® Wireless RF technology is featured in a new low power, wide area network (LPWAN) designed to deliver the benefits of the Internet of Things (IoT) to the remote destination of the Cook Islands. This network is the second deployment in the South Pacific by IoT network and software providers KotahiNet and Loriot that also created the LoRaWAN™-based IoT network in New Zealand. Both networks enable a wide range of smart city, agriculture, metering, environmental, consumer and industrial applications. 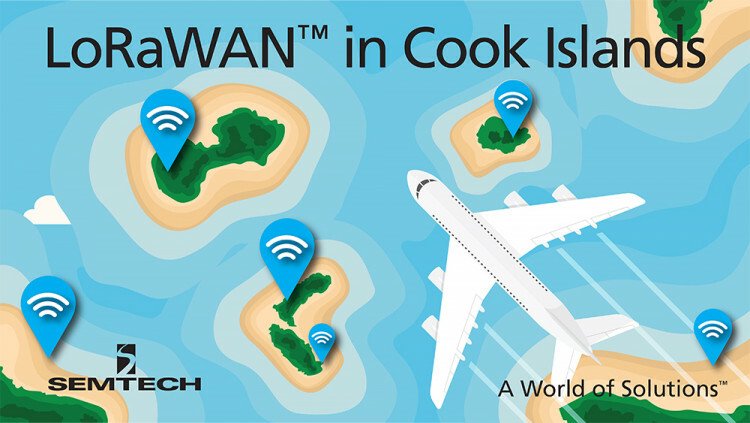 Working with the country’s sole telecom service provider, Bluesky Cook Islands, KotahiNet has initially deployed the LPWAN in northern Rarotonga, the largest isle in the chain, covering about a quarter of the island. Both companies plan to expand the network to the rest of the island before deploying it to the other islands of the country. This public LoRaWAN-based network provides the Cook Islands with a smart sensing infrastructure, allowing businesses and government organizations to collect and analyze environmental data, and make intelligent decisions about their business operations and scarce island resources. To help people understand the benefits and opportunities this new technology provides, Bluesky is providing free access to the network for people and organizations looking to test or connect a few sensors at a time. Following the deployment of the LoRaWAN network in New Zealand, KotahiNet is now building products and services that leverage the benefits of the technology. One example is a tank monitor for remotely measuring the level of a liquid or solid in a tank. This simple, versatile sensor uses KotahiNet’s LoRaWAN network to overcome the distance limitations and lack of long battery life typical of existing products. Similar connected products and other smart applications can also be implemented in the Cook Islands. Semtech, KotahiNet and Loriot are members of the LoRa Alliance, a group of more than 400 companies committed to driving and enhancing the LoRaWAN specification to ensure interoperability and scalability of LPWANs and IoT applications. Through its work with member companies and IoT industry groups, the LoRa Alliance is making LoRaWAN the standard for LPWANs focused on low-power, long-range IoT applications. To date, there are LoRaWAN public and private networks in more than 50 countries worldwide. KotahiNet focuses on real-time data from the physical world. It provides a purpose-built public wireless network across New Zealand based on the LoRaWAN specifications. The company also provides connected products and services operating on its network. For more information, visit www.kotahi.net. LORIOT is a Swiss start-up in the field of Internet of Things. Its core product today is software for secure, scalable, distributed, resilient operation of LoRaWAN networks and end-to-end applications. For more information, visit www.loriot.io. Semtech Corporation is a leading supplier of analog and mixed-signal semiconductors for high-end consumer, enterprise computing, communications, and industrial equipment. Products are designed to benefit the engineering community as well as the global community. The Company is dedicated to reducing the impact it, and its products, have on the environment. Internal green programs seek to reduce waste through material and manufacturing control, use of green technology and designing for resource reduction. Publicly traded since 1967, Semtech is listed on the Nasdaq Global Select Market under the symbol SMTC. For more information, visit www.semtech.com..
All statements contained herein that are not statements of historical fact, including statements that use the words “designed to,” “will,” “plan to,” “looking to,” or other similar words or expressions, that describe Semtech Corporation’s or its management’s future plans, objectives or goals are “forward-looking statements” and are made pursuant to the Safe-Harbor provisions of the Private Securities Litigation Reform Act of 1995, as amended. Such forward-looking statements involve known and unknown risks, uncertainties and other factors that could cause the actual results of Semtech Corporation to be materially different from the historical results and/or from any future results or outcomes expressed or implied by such forward-looking statements. Such factors are further addressed in Semtech Corporation’s annual and quarterly reports, and in other documents or reports, filed with the Securities and Exchange Commission (www.sec.gov) including, without limitation, information under the captions “Management's Discussion and Analysis of Financial Condition and Results of Operations” and “Risk Factors”. Semtech Corporation assumes no obligation to update any forward-looking statements in order to reflect events or circumstances that may arise after the date of this release, except as required by law.